Mohawk defenders attempt to tackle a Rock Hill rusher in their defeat Friday night, 33-0 in McDermott. 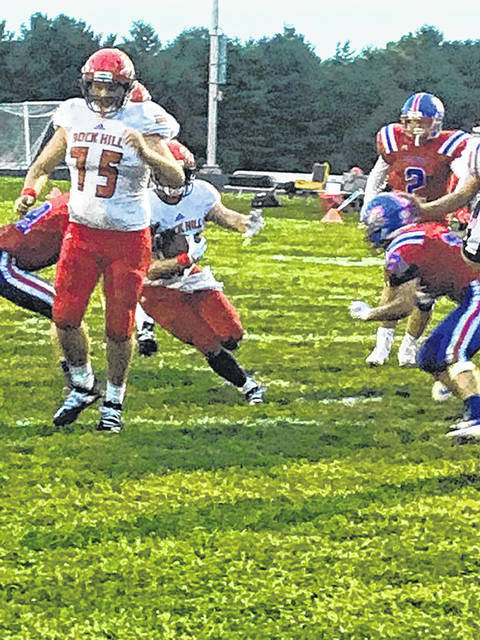 This week of high school football in Scioto County had the Rock Hill Redmen traveling to McDermott to take on the Northwest Mohawks in an OVC/SOC matchup. Both teams were coming off of defeats last week at home and were hoping to bounce back and grab a win this week. The night started off bad for the Mohawks, however, who put the ball on the ground on their first two offensive plays, losing both fumbles to the swift Redmen defense. Rock Hill’s offense was not able to capitalize on the turnovers, missing a field goal on the first, and ending the second with a turnover on downs. Both missed opportunities for the Redmen kept the score 0-0 at the end of the first. Turnovers would continue to be the story of the night for the Mohawks who put the ball on the ground a total of five times, losing three of those fumbles, and throwing one interception. Rock Hill’s offense took off after the first quarter, scoring on the last two drives of the first half. Both drives ended in rushing touchdowns for junior Zak Adkins making it 14-0 at half . The Redmen carried that momentum through halftime and into the second half where they scored on three of their four second half possessions. Second half touchdown rushes of four yards and forty-one yards for junior Logan Hankins and a touchdown run of 36 yards for sophomore Noah Burton put the Redmen up 33-0 where the game finished. Burton led the Redmen with 17 carries for 119 yards. The Mohawks looked stagnant in the rushing game, totaling only 68 yards on the ground compared to the Redmen’s 261 rushing yards. Promise showed in the passing game for the Mohawks when they decided to spread it out late in the game as they successfully moved the ball down the field into the redzone. However, the drive ended in a blocked FG. Mohawks QB Austin Newman finished the game 6-10 for 78 yards. Rock Hill will look to build on this win next week at home against Oak Hill. Northwest will try to grab their first win on the road against the Huntington Huntsman.